There is no doubt about it: Gold is back. With the Aussie gold price travelling sky high, a swathe of gold explorers are busy dressing up their resource in an attempt to see their valuations rocket on the back of this. Today’s tiny ASX gold explorer owns 100% of a 406,000 oz. 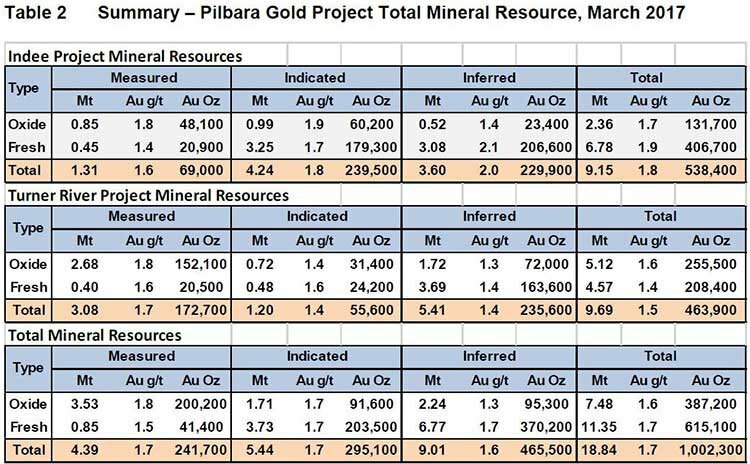 gold project in the Pilbara region of WA, and has been seemingly overlooked by the market to date. 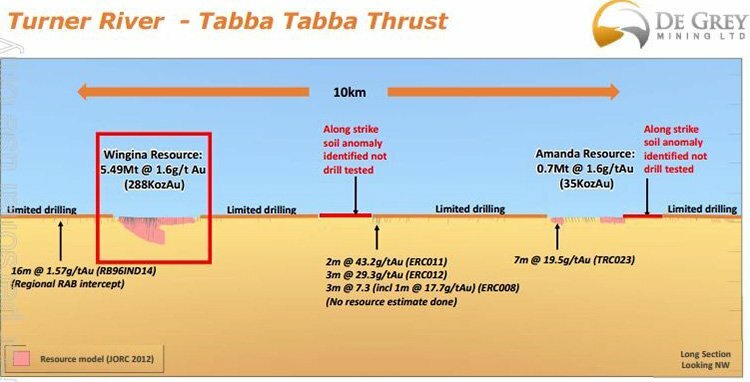 This little known ASX gold explorer is still capped at under $6 million, but had over $1 million in the bank at the end of the last quarter which is funding its current exploration round. This company is undertaking a crucial 1,500m diamond drilling campaign right now , which has the potential to significantly increase its gold resource. In the coming weeks as results flow, this company may be able to prove its doubters wrong, and show how its resource can demonstrate strong high grade potential. High grade gold lodes occur from surface and there is a 600m strike length with structurally controlled and thickened high grade plunging shoots. With easy to mine oxide gold prevalent, it won’t take much for this tiny company to re-rate on the back of strong exploratory drill results. 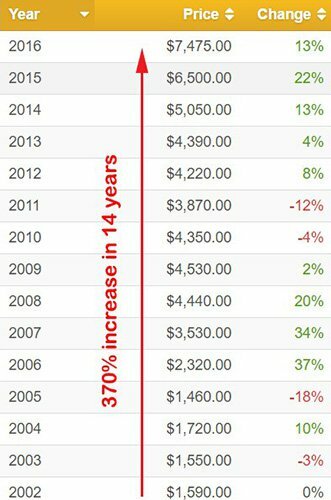 At the same time, this is a speculative stock, and there is no guarantee an investment will be successful. Always apply caution to an investment decision and seek professional investment advice. To top it off, it’s also got a prospective trend of 8.5km of lithium right in the heart of the Pilbara, down the road from Pilbara Minerals (ASX:PLS) and the dozens of other budding hopefuls hoping to strike more lithium. 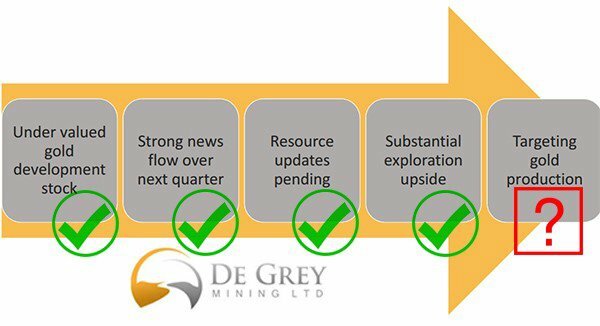 As we’ll go into later, DEG could be viewed as either a gold play, a lithium play, or a base metals play. It has, however, focused predominantly on the gold route for now, for the simple reason that it’s going to be easier, cheaper, and could provide a better early return than the other plays. DEG’s main project is the Turner River Project in the Pilbara region of Western Australia, with the project within roughly 50km of the major export port of Port Hedland and all the regional infrastructure that goes with it. The green patch of land on the regional map below is all DEG’s – and there’s no dilution of ownership here with DEG holding them 100%. Working in DEG’s favour is a lack of gold milling facilities in the Pilbara. DEG’s project has been around for a fair while, and has changed hands a couple of times – although DEG always had some role to play. Previously the market had seemingly written these assets off as being low-grade and not of much value – and that’s where we think there could be an opportunity here. The main play here is the Wingina Deposit, which it has pencilled in for initial development using an open pit – there are also at least two other satellite deposits in the works to act as feeder for any potential mill. 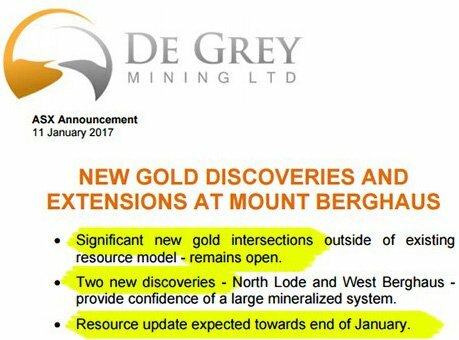 While DEG has yet to set out a Scoping Study for any development, the whole thing is shaping up to be a classic spoke and wheel production with gold from Mt Berghaus and Amanda to feed a plant at Wingina. As you can see, Wingina is the main game here with the bulk of the ore – 5.1Mt for 268,000 ounces to be exact. You can easily see an open pit set-up taking advantage of the shallow measured ore to start up, and then perhaps moving deeper from there. Metallurgical test work has also been done on the Wingina ore by a previous farm-in partner, with it finding that a simple CIL process can recover 93%. The thing about Wingina ore which has puzzled many in the space is that it appears to be ‘lowish’ grade — but there have been some pretty good hits along the way. We’re talking hits like 14.9m @ 10.9 g/t, and 34.1m @ 6.1g/t (including 7m @ 5.9g/t and 15.3m @ 9.3g/t). The question is, where are these hits hiding? As you can see from this sample tray, DEG is narrowing in on a zone of high-grade mineralisation. Some of the grades in the ‘high grade lode’ include 15.1g/t, 11.7 g/t, and even a 16.3g/t. The grades are there, but the theory goes that during initial drilling there were plenty of holes that missed the mark. As you can see above in the form of the very thin lines, there were plenty of previous drill holes that simply weren’t drilled totally into the two lodes – and even fewer deep into the fresh bedrock. The thing about these lodes which has captured our attention is that the high grade stuff has continued as far as DEG has gone deeper when targeting the lodes. According to all the geotechnical work done by the company to date – there’s no reason to believe that these lodes are closed. DEG is hitting the higher grades within these lodes, and it has yet to find the end of them. There is scope here to drill deeper into the lodes and firm up a deeper higher-grade resource which could potentially lend itself to underground mining. Luckily for DEG, it is in the middle of targeting these lodes at depth. We’ll go into the drilling a little bit later, but suffice to say hits of higher grades at depth could act as a catalyst for the company. We should note however that there are no guarantees in mineral exploration – and this alone shouldn’t form the basis of an investment decision. Weigh up all factors carefully before investing. Generally, gold is seen as a ‘safe haven’ store of value which has the tendency to develop a bit of a run on when the markets are worried about stability. Can you have an educated guess about what happened on June 23? Brexit sent shockwaves through world markets, and investors scampered for the safe-haven of gold. Works every time there’s a geopolitical shock like that – but the price of gold was on the march before Brexit anyhow. According to the World Gold Council, gold demand was up by a whopping 21% in the first quarter of this year – compared to the first quarter in the previous year. The demand, according to the council, was led by the central banks of Russia and China – who have been buying up big to shore up their reserves. All this love for gold has a flow-on effect all the way down to the fortunes of junior Aussie gold explorers such as DEG. DEG is clearly a very small cap stock so its shares can fluctuate, but the fact that the stock is up 200% in six months should tell you something about the broader sentiment for gold right now. Looking at the spot price of gold, the knock-on effect is already being felt amongst efficient gold producers already advanced towards bringing gold production to the table, just as prices are peaking. In Australian dollar terms, gold has set an all-time record of AU$1,857/oz in June 2016. Now while now that looks good, it’s worth noting that just as quickly as commodities go up, they can go down – so don’t invest in speculative stocks based on spot commodity prices alone. The not-so-easily-seen gold allure, as expressed in Australian dollars is having a huge impact on Aussie gold producers as a whole. The twin trends of asset accumulation and cost deflation have delivered strong share price and market cap appreciation amongst Australia’s new breed of gold miners. From the handful of mid-tier producers — as well as the aforementioned Blackham Resources, every single one has rallied strongly since the start of this year, no doubt buoyed by the rising spot gold price. 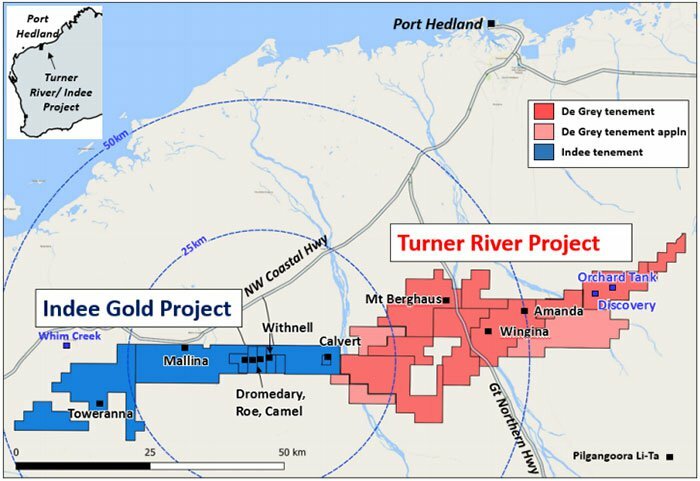 Could DEG follow in the footsteps of other Aussie gold companies? It all starts with the deep drilling campaign that is underway now. DEG is currently drilling all over its tenements, but its drilling at Wingina could unlock its potential. At Wingina, DEG is conducting 1300m of diamond drilling, consisting of a deep hole and a couple of short holes. The short holes will help it collect technical data on the structure of the lodes, but it’s the deep hole which has the potential to be something special and it is due to the way it is being drilled. What you’re seeing here is the extent of the lode DEG knows about – or at least can tell the market about. As you can see on the right, the target zone is well off the known extent of the lode. In fact, it’s about 150m off plunge . This means this tiny company is so certain about the lode that it’s willing to bet the cost of a deep diamond drilling hole that the lode continues on trend for 150m. It will effectively firm up a 150m extension of a high-grade lode, all at once. If it doesn’t hit, then it will finally know the extent of the lode and it can start planning around that. In any case, it is shaping up to be a big moment for DEG and its shareholders. As you’re reading this, the company is drilling right now – with results due back in the coming weeks. A lot of companies cry out in anguish about being undervalued, but DEG has a legitimate claim to back up its words. 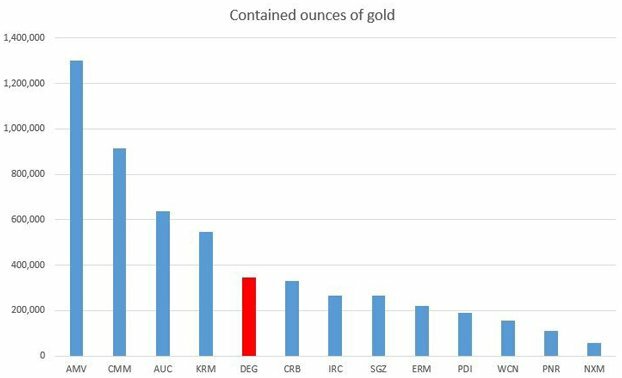 The below charts show a baker’s dozen of promising gold companies which are receiving a lot of love from the market at the moment. Some of these companies are in production, some aren’t, and some resources are conceptual in nature only. What they show indicate that DEG is fundamentally undervalued. As you can see, DEG is pretty much on the upper edge of the middle of the pack. Nothing to write home about, really. DEG is right at the bottom there, with plenty of growth to go to catch up to the rest. Here is a fundamental disconnect in the way the market has been ascribing value to DEG. If gold companies are traded because of the viability of their gold projects, and accurately reflect buzz over gold – then wouldn’t it be the case that DEG would be rewarded with a higher market cap? It has a good resources position – but hasn’t really found love at the market the way other companies in the sector have. You’d expect that at some point the market will catch up with what’s going on here, and that could be very soon given the pending drill results. Remember, we are just talking about DEG’s gold. The thing about DEG is that even though it’s pitched squarely as a gold play, it also an interest in lithium and base metals. If you’re in the Pilbara these days, shareholders almost expect you to be poking around for lithium, and DEG is no different. To date there has been sampling conducted on its tenements – and while it’s still waiting for grades to come back from the lab, what it found during initial reconnaissance work is worth checking out. As you can see, there’s a very promising trend firming up from Tabba Tabba running down into DEG’s tenements. The important things to note for DEG here is that number one, there are detailed chip samples due back from the lab soon, and number two, that just 5% of the permit area has been explored for lithium. So far there’s a prospective trend of 8.5km which has been identified, and DEG has literally barely scratched the surface. What the rock chip samples have told the company to date is that anomalous tantalum could reach to 92.3 parts per million, caesium of 397ppm, lithium of 194.5ppm, and rubidium of 1015ppm. There’s plenty more data to come out in the wash, though. Last month DEG said it would conduct follow up sampling, taking the form of soil sampling over the entire 8.5km trend length. We wouldn’t call DEG a lithium company at this stage, but the rocks aren’t going anywhere. Lithium is one of the hottest commodities going around at the moment, and positive news on the lithium front could provide the company with buying support from shareholders looking at access to lithium. It could also be the case that DEG manages to prove up the lithium and then has a player from the north and the south either buy it out or enter into a joint venture. What’s happening in the Pilbara at the moment is something akin to a land grab as multiple smaller players try to beef up their holdings to take advantage of shareholder support. Another thing which makes DEG and its Turner River project an interesting one to look at is that traditionally there had been base metals potential there. While the Orchard Tank and the Discovery deposits are thought of as longer-term fill-in potential for a gold project, they both also host their fair share of zinc, lead, and silver. As things stand, the two deposits combined have an inferred zinc resource of 69,000 tonnes, a lead resource of 29,000 tonnes, and 8 million ounces of silver. 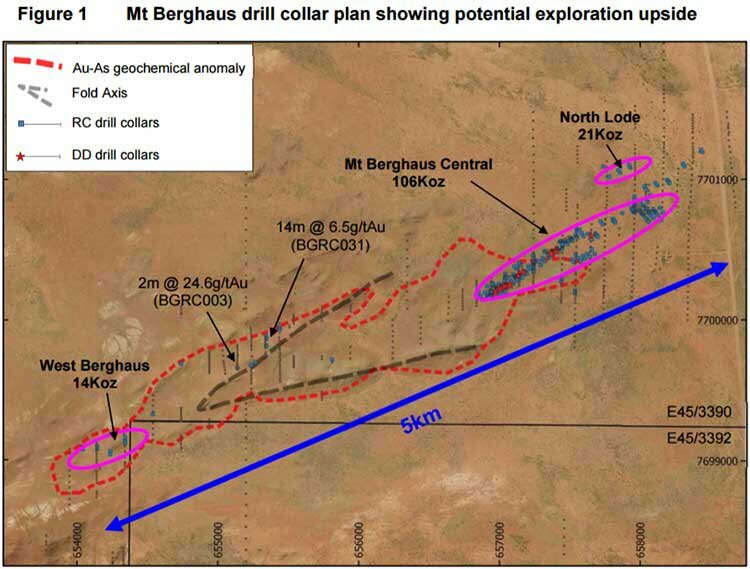 It has previously drilled at the project, the Discovery deposit in particular – with some promising grades coming back. 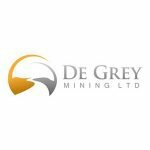 DEG has previously told shareholders that the mineralisation here remains open, meaning that there could be even more value. Recently DEG completed RC Drilling at its Discovery and Tabba Tabba prospects , with a total of 24 holes completed for 1646m. 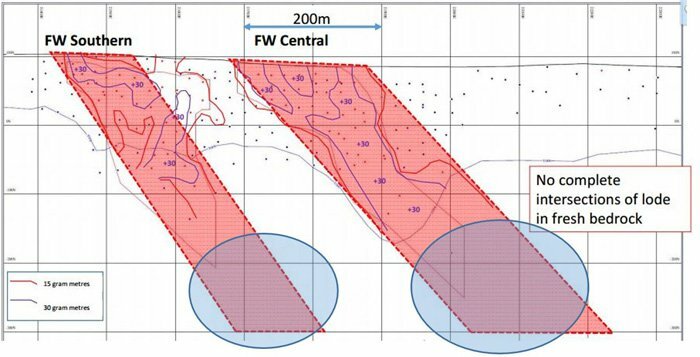 Drilling has been completed over a strike length of 350m, to better define the oxide mineralisation where previous limited drilling had intersected encouraging shallow mineralisation. Further drilling will likely focus on gold, and if a gold resource of substantial weight is found, there’s nothing in particular to suggest that it won’t open up development of the whole thing. On its own, the base metals project probably isn’t worth a substantial development – but the gold there could unlock the door to the capital needed to chase the deeper zinc and lead. 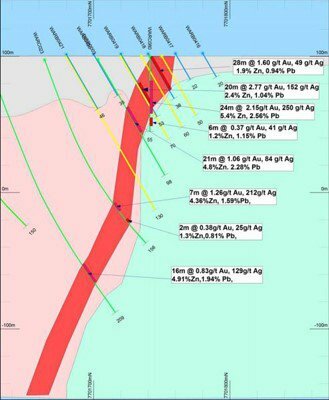 If DEG is able to justify that exploration, then it could develop a strong base metals accent to its gold hopes. We think that DEG may well be fundamentally undervalued, and we can’t see any particular reason why the market hasn’t seen this to this point. You’d figure that it will take a look at DEG at some point and put two and two together – and on that logic along DEG is worth a gander. Over the next few months it will have a whole heap of drilling results, both at its Wingina prospect and its shallower Discovery prospect. 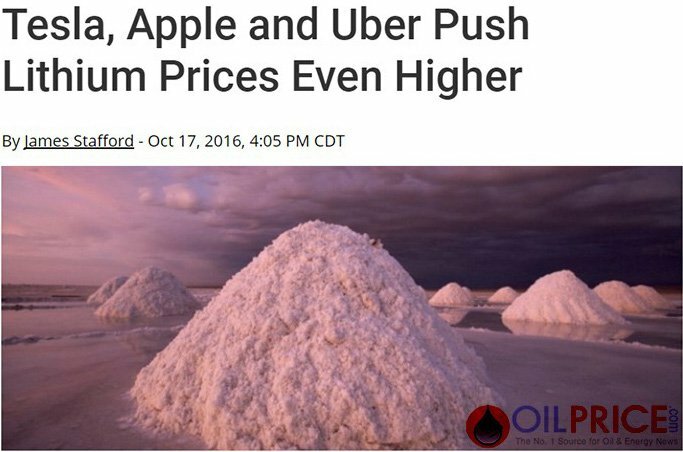 That’s not to mention the only other commodity which is heating up like gold is right now – lithium. However, like all tiny explorers – success for DEG is by no means a guarantee. It’s always a very good idea to seek professional financial advice before investing. 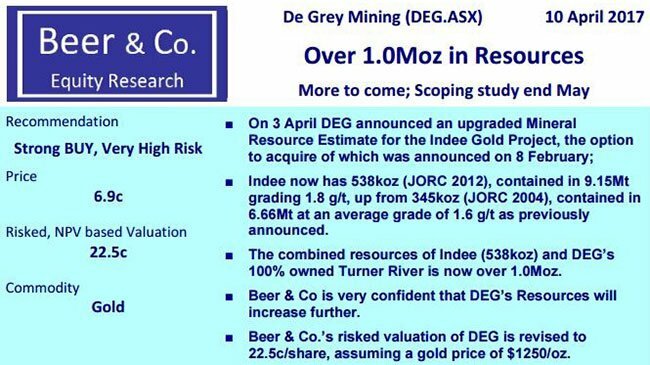 DEG’s deep drilling, if successful, has the potential to trigger a re-rate for the company.